It looks like the sources that tipped 9to5Mac off about the introduction of App Store improvements to Apple’s Retail Stores this Sunday were correct. Reports are now rolling in that show the new interactive iPad displays and other new features of Apple’s Retail Store 2.0 experience. The new iPad displays that have taken the place of the traditional paper placards offer an interactive way to explore the features of the products that they’re advertising. They also feature a call button similar to a nurse’s call button in the hospital that allows you to summon an Apple rep to the product for assistance. The image above and the ones below come from Mac Prices. In the topmost image you can see the new ‘call button’ that allows you to request assistance from an associate. Retail stores around Australia have launched ‘Retail 2.0′ to mark the 10th anniversary of Apple Retail stores. We knew this was coming but what exactly has happened? iPads display product prices & information for products. 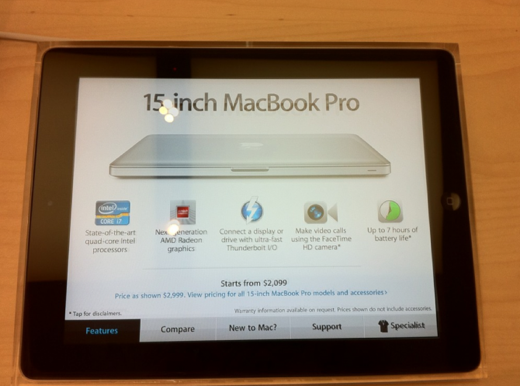 iPads display product features, prices and lets you compare between models. Use the iPad to ask a specialist to to come to you. Apple store staff appear to be wearing party hats. Twitter users are sounding off on the new changes in Australia. @andrewjamesmck: Apple store Robina looks like iPad interactive displays are up rumor 1 confirmed. This next image is from Twitter user @leoleakey and shows the interactive iPad display next to a MacBook. In addition to in-store improvements the new Retail 2.0 was rumored to bring an improved version of the Apple Store app as well that will allow for more detailed choices when making a purchase. The new app is not yet live here in the US but there is now a drop down notification on Store.Apple.com when you visit it from an iOS device. Twitter user Digisz has posted a series of additional images from the Apple Store in Sydney showing the new iPad displays and the store just before opening with employees on hand to handle the rush. He also says that Apple Store employees told him that he was the first customer to touch the new displays. We will continue to update this post with additional information on the improvements that have been made and images of the new store experience. If you’re in a location where Apple Stores are open, please let us know of any improvements that you see in the comments below.